More photos are on their way. Thanks for your patience. Boy pins his steady girl. Army-bound musical heartthrob comes to town. Girl almost kisses heartthrob on national TV. Boy decks heartthrob. Boy and girl live happily ever after. 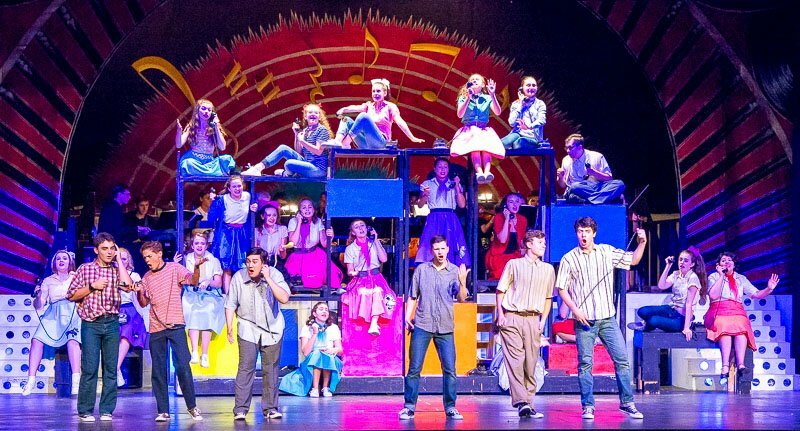 Audience lives happily in the moment as the Blake High School Summer Musical Theatre Institute dazzles audiences for another summer with its production of Bye Bye Birdie. Written by Michael Stewart, with lyrics by Lee Adams and music by Charles Strouse, this Tony and Emmy Award-winning Broadway play – turned TV movie – turned Blake Stage production ignited audiences with familiar and new-to-most songs and comedy. Enjoy some moments from the shows. Don’t panic if a sequence just stops; more photos are on the way.